Staff of Bottesford Post Office taken in 1912: James Rawdin is at the extreme right. 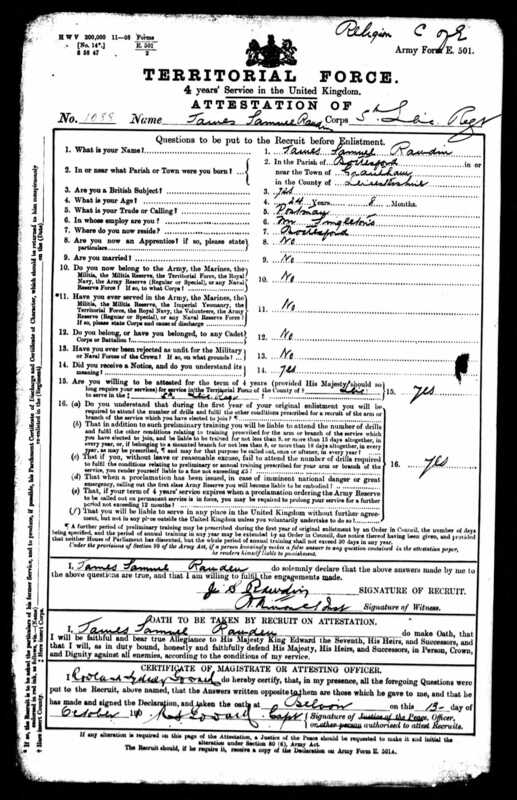 James Rawdin's attestation form, 1910. 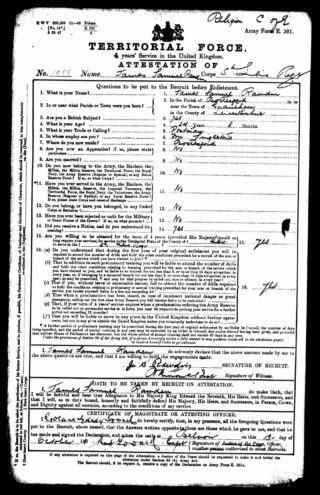 James Rawdin's Casualty Form, giving the reason for his discharge from the army in 1916. James Rawdin is remembered on the Methodist Roll of Honour in Bottesford, and is one of the men named on the Bottesford ‘church list’ of WW1 Servicemen. James Samuel Rawdin was born on the 11th February, 1887, and baptised on the 10th April that year. His parents were Samuel Rawdin, born in Bottesford in 1852, and Catherine Rawdin nee Bockin, who was also born in Bottesford, in 1847. James’ father Samuel was the younger brother of Thomas Rawdin, whose large family included six sons who were thus James’ cousins: they were another Thomas, awarded the DCM in the Boer War, and five brothers who all served in WW1. Samuel also had a younger brother named James, b.1857, after whom James b.1887 was named. According to the 1891 Census, Samuel Rawdin was a bricklayer and Catherine Rawdin was a dressmaker. They at 17 Queen Street Bottesford where there were five children. Earnest was 13, Maurice 11, Noel 9, Ada 7 and James 4. By 1901, the family had moved to 11 Queen Street, possibly into one of the cottages that were demolished in the Sixties. Noel was now 19, working as an apprentice iron turner/fitter, Ada Elizabeth was 17 and James, aged 14, was still at school. Sadly the oldest child, Maurice, died in 1905, their father Samuel died in 1907, and their mother Catherine died in 1909. James’ sister Ada married George Robert Singleton, a groom, in 1906 and lived on Church Street, Bottesford. 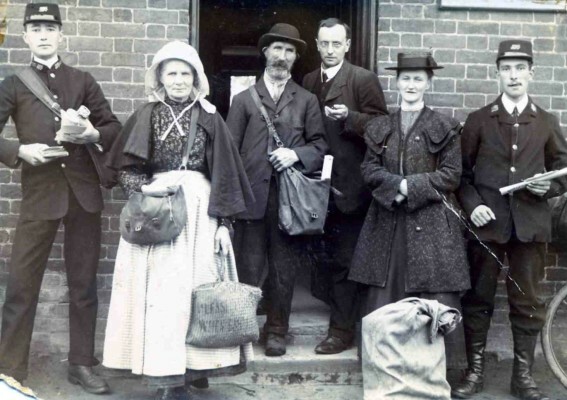 In 1911, James Rawdin was boarding in Chapel Street with his brother Ernest and his wife Mary Rawdin and their two children, Leslie and Catherine. He was 24 years old, working as a postman at the village Post Office. Unfortunately many service records were amongst those destroyed in WW2. 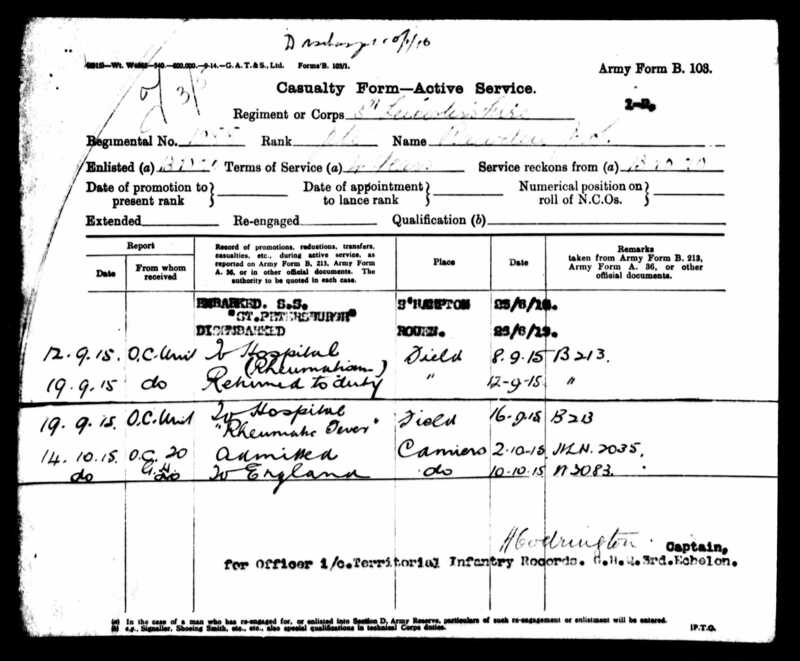 Some of James’s Rawdin’s Pension records have survived but sadly not his full service record. James attested and joined the Territorial Force of the 5th Battalion Leicestershire Regiment in October 1910 for four years, though eventually he served for almost six. His service number was 1088. He joined in Bottesford but this was sometimes recorded as Belvoir. At the time of his Attestation Oath at Melton Mowbray on 13 October 1910 he declared that he was working for Alfred Singleton and that his trade was Postman at the Post Office. He had a medical in Bottesford on 25th October 1910 and was declared fit for the Territorial Force. As a Territorial, he attended training at High Tor Camp during August 1911 and at Aberystwyth during August 1912. He was called up for active service as Private 1088, C Company, 1/5th Battalion, Leicestershire Regiment in August 1915. He travelled to France on 25th August 1915 with the British Expeditionary Force. He sailed on SS St Petersburgh from Southampton to Rouen. Within a month of arriving in France he was in hospital with rheumatism. He was sent back to the field on 12th September 1915, but by 16th September 1915 he had been re-admitted to hospital and was diagnosed with Rheumatic Fever. He was in hospital in Amiens by 2nd October 1915, and returned to England on 10th October 1915. His Medal Index Card records that he was awarded the 1914-1915 Star, the British War Medal and the Victory Medal. After his discharge James Rawdin moved to Sheffield and became an employee of Sheffield Corporation. In 1939, he was a general labourer and lived at 302 Queens Road, Sheffield. He died, a bachelor, in 1946 and buried on the 19th August at Bottesford, aged 59. In his obituary published by the Grantham Journal (30th August 1946) it said that he had been ill for some time and had been living with his sister, Mrs Singleton, in Chapel Street Bottesford. He was buried at Bottesford. 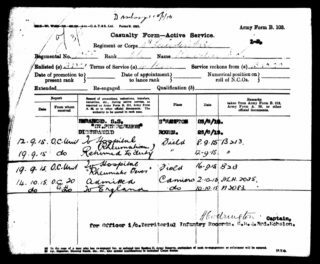 Discharged from the army in 1916 because he was suffering from rheumatic fever.